Once again we are presented with an album for review that is not a jazz album per se, but rather from an artist that has studied jazz in great depth (McKee has a Masters Degree in Jazz Performance from the Guildhall School of Music and Drama), and is of a new generation of singer/songwriters that work their way out of the tradition of jazz singing into the realms of the contemporary music of the last fifty years. 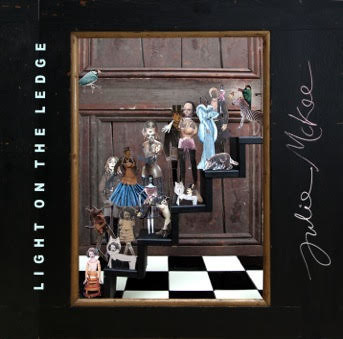 To add to, or confound expectations, this is not strictly speaking a new release as the album was originally released in 2014, but McKee was unsure of how to promote or market material that does not sit comfortably as a jazz or pop album (although I am convinced that there is single to be found on the superb 'Upstream') . Instead the recording has remained quietly in her discography until she could decide just what to do with it. Well, thank goodness the decision has been made and the singer has decided that it the time is right to relaunch Light On The Ledge with a showcase performance at Brunel Museums' newly refurbished Grand Entrance Hall on 16th April 2016, which will hopefully bring wider exposure for this wonderful album. In her writing (all bar one of the songs is penned by McKee), and with her vocals we are presented with a unique songstress and storyteller who has all the bravura of Kate Bush and the ability to communicate in a most compelling manner. Combining an individual and distinctive tone, she writes without any sense of parody but with an equal measure of seriousness and humour that allow her narratives to unfold during the course of the song. There is no excess or superfluous gestures to be found, with each piece individually crafted to reveal the heart of the composition and lyric without any empty rhetoric. The same can be also said of the superb string arrangements by Harvey Brough that bring a gravitas to proceedings where appropriate or by contrast a deft lightness that lifts the mood and spirit of the song. Of the other musicians bassist Andy Hamill keeps things rhythmically secure, whilst reedman Kemp plays some lovely clarinet on 'Get Off The Ghost Train' and tenor saxophone on the only non original 'In The Gloaming'. Added to this, McKee's piano playing is lithe and supple, and the perfect foil to accompany her vocal. Each new playing reveals hidden depths with the songs, and any favourites on one hearing may be quickly usurped on the next. Having said this, aside from the fore mentioned tracks I remain captivated by the clever and witty lyrics of 'Get Off The Ghost Train', and the utterly beautiful 'The Bells of St Clements' and 'Dancing For Tips'. Picking favourites is all well and good, but in the end does nothing but an injustice to an album that is brimful of invention and a delight from start to finish.